If you have any questions, please contact us at (330)678-3200. Also, you can reach us via email at info@dailymonument.net. We'll get back to you as soon as possible. Our main office is in Kent (Brimfield) Ohio. 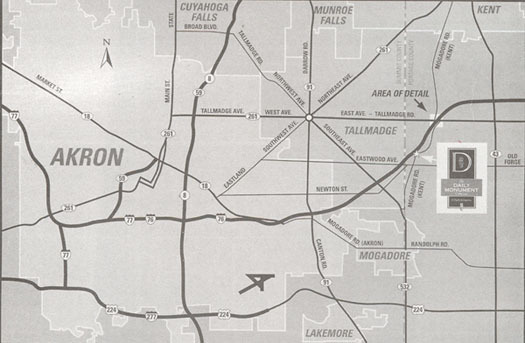 When coming via I-76 East, get offat Exit 31 (Tallmadge Road/County Road 18). Halfway down the exit ramp, make a sharp right (Mogadore Road, Kent). We're about a mile down on the right.